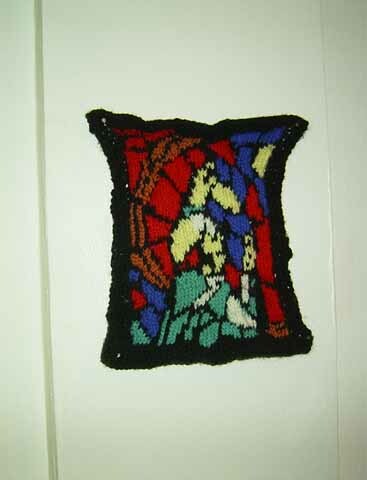 Alice Newstead’s piece Stained Glass uses intarsia knitting to recreate a stained glass window. Intarsia is an Italian word derived from the Latin word interserere, which means “to insert”. Intarsia is a knitting technique that allows blocks of colour to be worked from separate balls of yarn to create a knitted image. The word intarsia is also used in mosaics, providing yet another link between architecture and knitting.